Description: Daily Express Publication, 1984, with cartoons from September 23, 1973 – July 16, 1974. Laminated card, approximately 26 x 19 cm tall: black and white cartoon drawings throughout. Condition: papers lightly tanned, very clean and good overall. 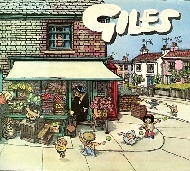 Mary Ward Books is an independent online bookstore specialising in second hand, out of print books and used books such as Giles Sunday Express and Daily Express cartoons Twenty eighth series by Daily Express publication. We offer a book search facility and secure payments via PayPal and Nochex. Mary Ward Books is based in East Anglia, United Kingdom. We were established in 1997 and have been selling books online since 2002. We ship worldwide, please click here to see our shipping charges for Giles Sunday Express and Daily Express cartoons Twenty eighth series by Daily Express publication. We have many other books in our Comedy section for sale of which below is a selection - Please feel free to browse them or press the 'continue shopping' button below to see the entire Comedy category.